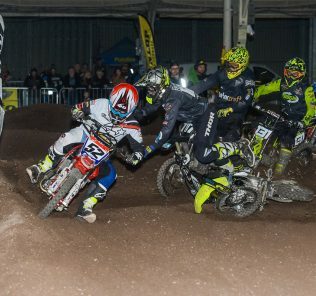 The smells and sounds of the 2017 Minibike Supercross Championships resonated around the hall’s of the Dirt Bike Show at Stoneleigh with a record 148 entrants taking part in another hugely successful weekend for the Minibike Champs crew. As always the MBC pulled out all of the stops when creating the circuit, using a completely different layout to previous years and making it a longer lap. An excellent entry for the 50cc Kids class meant there were two groups of young racers gunning for Supercross glory with the fastest 12 heading into the A class. After making an appearance at the Summer’s World Minibike Champs Zane Stephen’s turned on the style to finish with 6 race win’s out of 6 and taking the coveted title. Ben Casey was Zane’s closest challenger and finished 2nd overall edging out Hayden Statt who came a good third. In the B group the win went to Ben Johnstone who stormed to three win’s on the Sunday to gain a points advantage over 2nd placed Kasey Crampton, and Saturday winner Finnley Cookson who finished third. In the Youth Junior class Harry Streeter gained an excellent win over his MBC rival and champion Senna Ace Summer’s who finished 2nd with Mickey Bennett gaining the third and final podium spot. Louis Dutton continued his fine season in the Youth Senior class by following up his World and British Minibike Champs titles with the Supercross win with an immaculate unbeaten performance. James Lee had a good weekend for 2nd, but only just as 2 points further behind was third placed racer Reuben Bailey. The resurrected 50/88cc class was won by Ash Gorman who showed his liking for racing the smaller machines with 5 race wins over the weekend. On the last race of the day 2nd place finisher overall Craig Powell took a well earned chequered flag with third placed Michael Lyons also coming home ahead of Gorman for 2nd. It didn’t make any difference though as Gorman had accumulated enough points to claim the title. Lee Mitchell made up for his Minibike Champs disappointment by taking the Master’s win, with Russel Jepson in 2nd and Jamie Stokes third. In the Vets Jason Gutteridge had a consistent weekend to take the win over Gerald Hodgekins who came 2nd and 2017 British Vets MBC champ Chris Rose coming third with a low scoring Saturday making his 3 wins on the Sunday still not enough for a top two position. Another class with a double entry was the 110’s and in terms of entertainment these races were epic. It was like a family reunion at the front of the field in the faster A class with the podium being taken over by the Pocock family. Matthew Pocock had been threatening a big result all season long and did just that by beating his British MBC Pro Class brother Bradley to the win with Pro MX racer Mel Pocock in third. Oscar Stearn was dominant in the 110 B Class with the overall win with Joel Smee in 2nd and Sam Mathews in third. Consistency won out for Kris Ayres in the 140 class with two strong points scoring days giving him the victory in the 140 class, with 50/88 class winner Ash Gorman 2nd and Luke Humphrey third. The stacked 160 class was split into three, with qualification times declaring which race riders would be in, with the fastest being in the Pro’s then the Expert A then the Expert B.
Michael Gwilliams was the victor in the Expert B category with a strong Sunday giving him the edge over his rivals. The second place finisher was Leon Adams, and with a maximum 3 race wins on the Saturday Ash Arrowsmith came third. It was tight at the top on the Expert A’s with James Cook claiming the number 1 spot by a slender 3 point swing over 2nd placed Daniel Fisher. Steve Ledger came third. Always awesome to watch the Pro class once again served up a feast of Supercross racing. Dominic Foreman continued his superb end of season form by taking the title over the returning Troy Beck who showed he has the speed to mix it at the top end of the Minibike tree when he returns to the Minibike Champs ranks in 2018. Top AMCA MX racer Luke Dean placed himself on the third spot of the podium with a consistent weekend of results with MBC stalwart and Pro Minibike Champs runner up Blaine Blackwell in 4th. So that brings a close to the 2017 Minibike race season and it’s sure been a good one and we look forward to following all of the action again when the Minibike Nationals comes back round in the Spring.